The third installation of Food Social is coming up this Saturday, featuring aspiring and innovative street food chefs! It's similar to a food truck event, except with all local street food vendors. The cost of admission is $5, but you can get in for FREE with the promo code: "SJ Blog"
More info below and you can register right over here. Food Social, a street food marketplace, features locally produced fare from the Bay Area’s next big culinary talent. An incubator for up-and-coming street food vendors, Food Social brings a whole new meaning to “eating local”. Try new dishes ranging from $5-$8, mingle with new friends, and enjoy a beautiful outdoor terrace under the stars. Smooth sounds provided by Skechmoney. Saturday, October 15th, 2011 5pm-9pm. Food Social was created to shine the spotlight on a different part of the street food vending journey…The very beginning. The idea behind Food Social is to provide a forum that showcases up and coming street food vendors in a way never before experienced in the South Bay. After personally experiencing the long, arduous path toward building a successful cart, we wanted to open up a channel for new food vendors who are working their way up the ladder to build fans and share their fresh food ideas with their local community. 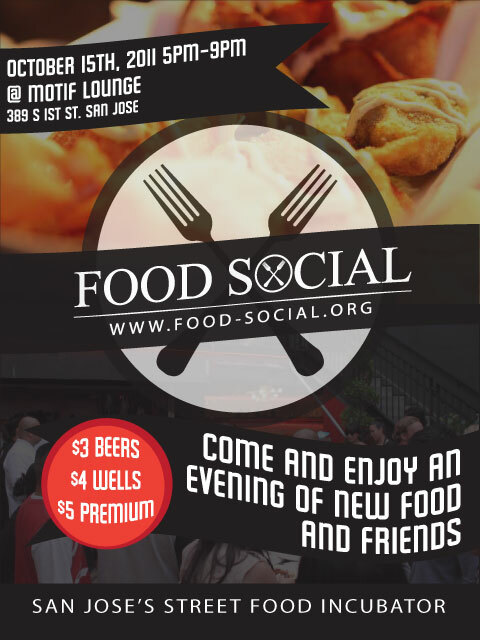 Attend Food Social and take an exclusive look at the delight that is being cooked up right in your backyard. Where is there street food in San Jose, besides the hot dog guy, who's rarely out anymore? That's why you have to come down and see what's coming soon to local street corners!